Our experienced ACA trained instructors teach invaluable skills for creating your own adventures! Learn how paddle more efficiently, increase your safety and have a fun day on the bay while the sea otters and seals look on. • Classes can be taken in open deck or closed deck singles. • Kids should be 13 years and up. * Classes require a little more preparation, so arrive 30 minutes before start time to get the most time on the water. * We recommend booking at least 24-48 hours in advance to ensure the class/space is available. Bookings require full payment in advance. See full cancellation policy & weather links. Check-in at our store in Moss Landing's North Harbor. We have a full retail store with restroom, changing rooms, and parking. Increase your confidence on the water with solid basic skills to control your kayak, prevent a capsize, and help with assisted rescues. See dates, availability and reserve online. This two hour class is the perfect chance to learn about the sport of standup paddleboarding. 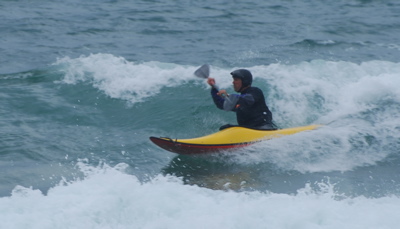 This class will cover basics of board and paddle design, efficient strokes, turning, speed and safety. $50 per hour/per person with a 2 hour minimum.